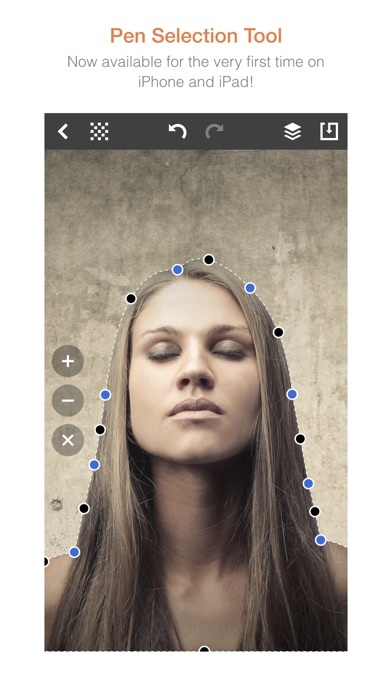 Quickly remove unwanted backgrounds or create razor-sharp photo cutouts with the Pen Selection Tool. Previously found only in advanced desktop programs, now available for the very first time on iPhone and iPad with a streamlined and much simplified implementation optimized for touch. This incredibly versatile tool offers unique capabilities unmatched by anything else on the App Store. It’s an integral part of the professional toolbox and artists and photographers have relied on it for decades. Now you can too! You no longer have to waste hours working on a single photo only to achieve less than satisfactory results. With Exacto you can make pixel-perfect selections that precisely trace the contours of any subject, no matter how intricate or complex. But that’s not all! Exacto even goes beyond the standard functionality of the Pen Selection Tool by introducing features that provide greater flexibility and control such as the ability to delete and insert points anywhere in the selection, the ability to reset control points, and most importantly, unlimited layers for making multiple selections. In addition, Exacto offers other advanced features that greatly enhance the user experience including unlimited undo / redo, projects autosave, instant preview, and much more! Here’s how it works: 1 - Place points around an area of interest then drag them into position to make a selection. 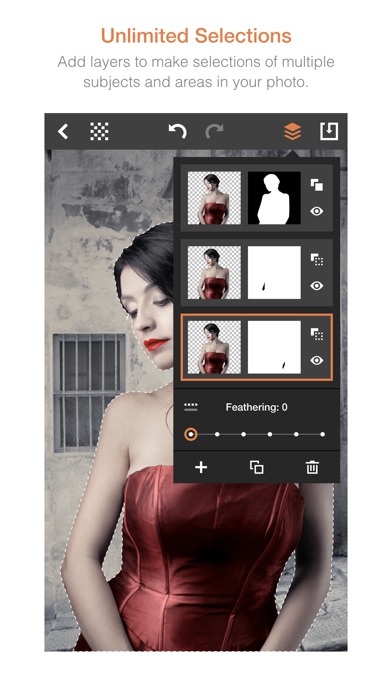 2 - Add layers to make selections of multiple subjects and areas in your photo. 3 - Keep track of your progress with the full-size instant preview option. 4 - Made a mistake? With unlimited undo / redo your entire editing history is preserved, from start to finish. So you can go backward or forward as many steps as you need. 5 - Must leave in a hurry? With autosave your work is never lost and you can pick up right where you left off at any time. 6 - All done? 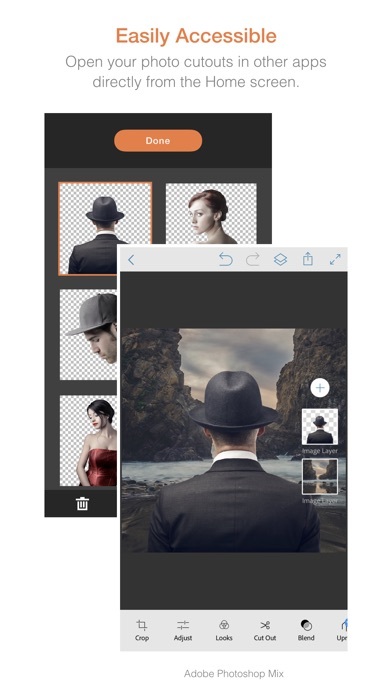 Save your photo cutout to the Camera Roll or open it in other apps. There’s no limit to the fun and exciting ways you could use your photo cutouts. 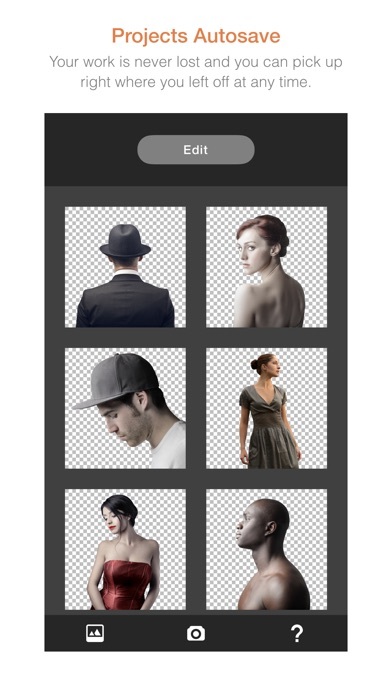 For example, you could: 1 - Superimpose them on different backgrounds. 2 - Insert them in work or school presentations. 3 - Use them as stickers in chats. 4 - Use them in creating decorative art. 5 - Print them out and make actual cardboard cutouts for special occasions. and on and on! Experiencing issues? Have comments or suggestions for future updates? Please contact us at support@exactoapp.com. In just a few minutes, I was using the app with confidence and enjoyment. The “feathering” feature is nice and makes the image look high-etched. I like this app. Nothing “Magical” or even worthy of $1 here! This app invites you to spend time working on your projects! Have used this a lot until i purchased my new Xs with ios12.0.1, the problem arose when trying to save and getting “Access Denied” which is very frustrating after working on an especially detailed image. Hope the resolve SOON! I tried to send you this feature request in an email to you using your "Contact Us" button on the website. But, it came back saying it couldn't be delivered. So, I'll do it it here I guess. I spent forever writing that email, I wish it had gone through. I don't believe it's a problem on my end though. But, my request is - would you please consider adding a feature to Exacto that allows us to turn the hyphened or perforated outline line from white to black please? 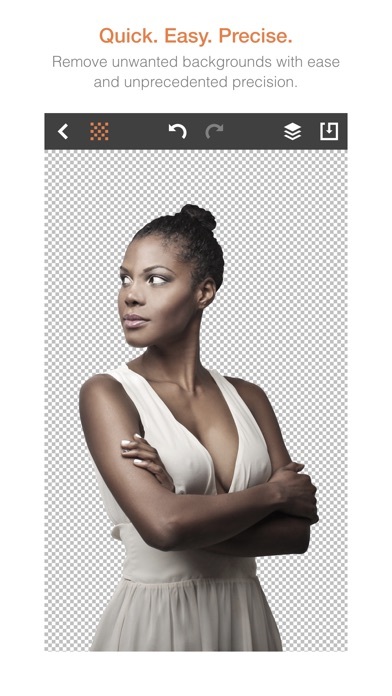 When trying to cut out objects in photos where the background is predominately or completely white. Well, I can't make out the outline line very well at all because it's also white so it just blends into the background of the photo. If you would please implement a function to allow us to change that outline line from white to black and then back again, I would be really grateful and thankful and thank you if you'll consider my request. I really wish your email was working, I explained all this better in there. And I don't know if you'll ever see my review making this request by trying to send it to you this way as opposed to the email. So, if you'll look into making sure your outlook or whatever email works, I'd appreciate that as well please, thank you. And thanks so much for this wonderful application and all the time and hard work you've no doubt put into building it, refining and patching and continue to put into it by improving it as well. I'm grateful for all that. I expressed my praise better in the email I tried to send, so much more so. But, I really am thankful for this app and use it exclusively in my animation work. Well, again, hope you'll see this and maybe please reply and I hope you're doing well and God bless. I bought the app spent a lot of time perfecting the next to impossible points and tried to save it and it said access denied. What the heck!! So in other words I just waisted a lot of time and threw away $3.99 all for aggravation and no end results that I needed. Tell me how do I go about getting my money back?? Thanks for creating this app, it’s very accurate and intuitive. The masked objects have loaded seamlessly into my various editing apps for merging and adjusting. The detail I can get is terrific!